From March till July most mornings we will host a FLYING LOW class, mostly taught by David Zambrano himself, and occasionally by Milan (Mino) Herich and Paola Madrid. 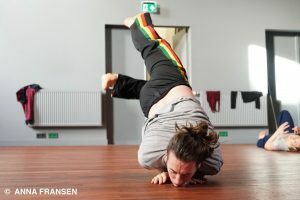 One of the weeks, it will be Youri De Gussem teaching a contemporary dance class, including his experience of Flying Low. This class, developed by David Zambrano, focusses mainly on the dancer’s relationship with the floor. The class utilises simple movement patterns that involve breathing, speed and the release of energy throughout the body in order to activate the relationship between the centre and the joints, moving in and out of the ground more efficiently by maintaining a centred state. There is a focus on the skeletal structure that will help improve the dancers’ physical perception and alertness. The class includes partnering work and movement phrases, which explore the primary laws of physics: cohesion and expansion. 15 Euro for 1 class. 60 Euro for 1 week of 5 classes. For over 35 years, David Zambrano has been a monumental figure in the international dance community, and his passion for cultural exchange continues to influence his work. Living and making work in Amsterdam and Brussels, and teaching/performing internationally, Zambrano is an ambassador and liaison across many borders, bringing together artists from all over the planet for his projects. An inspiring teacher, thrilling performer, and innovative choreographer, Zambrano has contributed generously to the field of dance in ways that have influenced many and impacted the dance world from several angles. Born in Slovakia, Milan began his first dance steps in the Slovakian traditional children’s dance company Dumbier and graduated at the Banska Bystrica Dance Conservatory. Later in 2002 he continued his dance training at the renowned school P.A.R.T.S under the direction of Anna Teresa de Keersmaeker, in Brussels. He worked with different choreographers and companies like Ultima Vez / Wim Vandekeybus in the creation Puur (2005), Booting Looting (2013) and Sidi Larbi Cherkaoui to create the show Myth (2007). Since over 19 years he is in continuous collaboration with David Zambrano as an assistant in classes and workshops and as an interpreter in the works: 12 flies went out at noon, 3 flies went out at noon, Rabbit project, Soul Project and Holes. Milan Herich is co-founder of Les SlovaKs Dance Collective creating the works Opening Night (2007) Journey Home (2009) The concert, live concert of traditional music and singing (2010) and their last show Fragments. Since 2013 he has also collaborated with the choreographer Anton Lachky on the creations Mind Gap and Side Effects. Milan created together with David Zambrano “A Solo for Mr.Folk” making presentations in Europe and Latin America. For many years he has been coaching and choreographing in works of renowned circus company Rasposo in the productions Morsure (2014) and La Dévorée (2017. In end of 2018 he directed and choreographed a full evening performance together with Petr Forman “ Turn over a new leaf” for the circus school ESAC in Brussels. From México. Performer, Choreographer and Dance Teacher. Graduated from the Professional Dance School of Mazatlan in 2011. Paola is the director of her dance company SORTA. 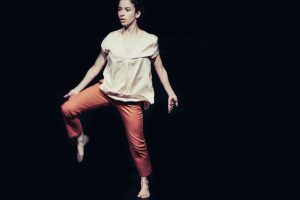 She has been developing Movement Research- dance training proposal and with it participating in several art centers and festivals around México and Europe since 2013. She is currently member of the companies “Physical Momentum” by the choreographer Francisco Córdova and “Insiemi Irreali” by the artistic director Pietro Marullo. Artistic Development FECAS 2010 and 2013. She currently resides between México and Brussels . Born in Brussels in 1992, Youri De Gussem started hip hop dance at the age of 11. He learned contemporary and ballet dance at the Athénée Royal des Beaux Arts of Brussels. In Studied at the Royal Conservatory of Antwerp and at P.A.R.T.S. in Brussels. As a dancer, Youri worked with many choreographers. He took part in Body Design in Urban Spaces of Willie Dorner in Antwerp for the opening of the MAS museum. He played in Dodo Groot of Land Zonder Ei, a theater piece directed by Dimitri Leue in HET PALEIS in Antwerp. He danced an extract of Babel by Sidi Larbi Cherkaoui/Damien Jalet at the Louvre in Paris. He worked Luxembourg for the creation and the interpretation of Flock by Jean Guillaume Weis. In parallel, he put all his attention to the development of his own artistic as well as the development of the company Zemiata in collaboration with the choreographer and dancer Julie Querre (FR). Performing in several international festivals in Lisbon, Brussels, Antwerp, Stuttgart, Copenhagen, Arnhem and Corfu. Through the class, we will seek our body physically to go toward a self-transcendence and find ways to recycle, renew our energy beyond exhaustion while remaining in motion. The class will be mainly based on floorwork technics, inspired by flying low and others approaches by using the floor as a dance partner. With those technics, we will seek to better understand our mechanics, the physical laws that govern our movement, in search of a field of richer possibilities in our dance and out of our comforts zones. We will then, through different exercises, dance phrases and improvisations, overcome our limits, our personal boundaries and bring our physical and bodily skills to another level. What interests me is to see how far the human body can go without physical damage. It will be a very physical, dynamic and emotional experience that will connect the body and the mind.